Gov. Rick Snyder cited the danger posed to motorists by Michigan’s crumbling roads as a major impetus for the deal. It went down to the wire, but a deal to fix Michigan’s crumbling roads was reached on the final day of the 2014 lame-duck session. In a testament to how leery legislators have become of raising taxes, however, voters will be asked to provide the key piece of the deal – a one-cent hike in the state sales tax, to be put on the May 2015 ballot. Voters will get the chance to put their money where their mouth is in May. If approved, the state sales tax would rise from 6 to 7 percent. The package of bills repeals the current state sales tax on gas and institutes a new fuels tax dedicated solely to roads. The one-cent increase on the May ballot would go to make up revenue to schools and cities that would be lost from the fuel sales-tax repeal. The new fuels tax is expected to generate $1.2 billion for roads and bridges, as well as $112 million for mass transit, among other revenue. Early reaction to the deal Thursday was positive. Amber Arellano, executive director of The Education Trust-Midwest, a state education reform group, expressed relief that school funding would not take a hit, as had been feared with earlier proposals. “We need to see more of this kind of creative, bipartisan leadership working together to advance the interests of all of our students and to close achievement gaps in our state,” Arellano said in a statement. Reaching a deal to repair Michigan’s poor-quality infrastructure was Gov. Rick Snyder’s stated number one priority for the lame-duck session. Ridiculous that it took this dysfunctional legislature so long to come up with something. They have passed the buck. They are now going to say that we raised our taxes. Why couldn't this have been done so we could have voted on it in November? Now we miss another year of fixing the roads. The really unfortunate part of this is that it only piles more disincentive and distortion onto one of our many poorly conceived governmental systems. What sense does not taxing Sports event tickets, golf fees, massages, T-bone steaks but hits you 7% when you buy your kid a winter coat or food for your dog? Not to mention the incentive/disincentives this high sales tax places on retailers. The entire sales tax law/system needs to be restructured rather than piling more stupid onto already stupid. This last minute stuff is almost always bad. I agree with "buy(ing) your kid a winter coat" but "food for your dog" is every bit as much a luxury item as the other items you mentioned and ought to be subject to sales tax if those are. Rightly or wrongly most people don't consider their dog or cat to be luxuries. But the point is that there are many things just as necessary to maintaining life as food but are still taxed. Again the point is that our system only thinks one catagoriy of expenditures should be subject to tax so that we pay a higher rate in that area in order to exempt all the others. I'm sure they don't, but that doesn't mean tax policy ought to indulge them. Your larger point--that of tax expenditures--is on the mark, but we just voted, two-to-one, to validate a huge one: the exemption of most business personal property from the general property tax. The Snyder administration said many times, "There's no such thing as a pension tax; we're just closing a loophole in the income tax." I never heard them say, though,: "There's no such thing as a personal property tax; we're just opening a loophole in the general property tax." 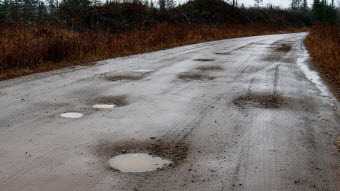 The story on this at MichiganCapitolConfidential.com was better: "The Michigan Senate’s plan to find more money for road repairs was a $1.2 billion gas and diesel tax increase. "The State House’s response was to shift some current state tax revenue to roads, with no net tax increase. "Leaders from both sides came up with a "compromise," which was adopted in the predawn hours of Dec. 19: Increase state taxes and spending by $1.9 billion, of which just $1.2 billion goes to fix the roads, and the rest for other areas." Voters need to vote NO on this and make our legislators go back to the drawing board. Legislature missed a golden opportunity to raise the road tax funds by additional fuel tax while the price of fuel is low. This is the most fair way to fund roads in as much as it has some relationship to the individual use and damage to the roads. Heavier more damaging vehicles use more fuel than lighter vehicles. People who drive 50000 miles a year use more fuel than those driving 5000 miles a year. The proposed change is just a tax shift but unfortunately it makes all consumers pay for the roads regardless of how much you use them. Same goes for raising vehicle registrations. No matter how many cars I have I can only drive one at a time. Why should they all be taxed the same? There is no fairness in taxing registrations. The placing the issue on the ballot gives the impression of a group of people (elected officials) that don't know enough about the issue, the voters, and are afraid to learn so they are shifting the respnsibility from themselves to the public. My best guess is that the ballot issue will be voted down because people see it as a way for the legislature to manipulate the general fund spending in a fashion similar to when the lottery was taughted as adding to the education funding. I have to say that I am more interested in getting value for my tax dollars then I am in simply spending more and more of them. The person that could speak to that is the one who is responsible for those who are spending the money, and yet it seems the Governor only talks about wanting more money not about spending is smarter. To me this "compromise" looks good (a vote of the people) but just passes the buck and ducks responsibility. The Legislature and the Governor clearly dropped the ball on this one. Roads need to be fixed right now---not in six months. And what happens if the ballot proposal fails? Will we have to go through this whole song and dance again? And roads still will have to be fixed. Plus a Statewide ballot proposal in a non election year will cost at least $10 million. Who will pay that? I'd be willing to pay an additional fuels tax as long as that money was spent on road repairs and nothing else. That makes sense---the more you use the roads the more you pay. I've attended several Center for Michigan's "community conversations" and the results are always the same because you utilize push polling to achieve your desired results. Any problem can be resolved through higher taxes rather than through elected officials making the choices they were elected to make with the revenue they already collect.